Terrorist shot by security forces after emerging from a taxi to stab soldiers at Tapuach Junction. An Arab terrorist attempted to stab an IDF soldier at Tapuach Junction in Samaria, but was shot dead by alert troops before he was able to carry out the attack, according to initial reports. 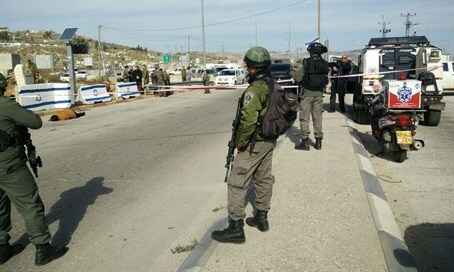 According to an initial investigation, the incident began at around 10:20 a.m., when a Palestinian taxi arrived at Tapuach Junction and stopped close to the guard post where soldiers and Border Police were stationed. Suddenly, the terrorist emerged from the car and sprinted towards the soldiers with a knife in his hand. Forces immediately noticed the threat and directed accurate fire towards the attacker, neutralizing him. A large number of Border Police then descended on the scene. Security forces are currently pursuing the vehicle which was involved in the attack. The precise condition of terrorist who was shot is unclear. In related news, IDF forces continued an extensive counterterrorism operation focusing on Palestinian Arab villages in Samaria overnight. Troops from the "Duchifat" Brigade of the Kfir Infantry Division confiscated an illegal M16 assault rifle from the village of A-Zawiya. Elsewhere in the area, forces arrested five wanted terror suspects in Kfar Katna, and seized a large cache of weaponry, including ammunition, knives, binoculars and IDF uniforms and assorted equipment. IDF officials say that village in particular has been a hotbed of anti-Israeli violence since the recent escalation in terror attacks began at the start of October. A number of terrorists who carried out attacks throughout the country - including the terrorist who stabbed IDF soldier Ziv Mizrahi to death on Monday - coming from there.